This week 19-year-old Jeong Woo-Yeong made his debut for his club Bayern Munich as the Korean midfielder played the final nine minutes. It was a perfect game for the young man to come into with his club-leading Benfica 5-1 at the time in the Champions League. Meanwhile, he came on to replace Thomas Müller the decorated German forward which would have been a huge honour am sure. Jeong Woo-Yeong signed for the German Champions on the 1st January 2018 to join their youth team. The Uslan born player moved from K League 1 side Incheon United on a four-year contract. The player is a quick and skilful versatile attacking midfielder who has already been compared to Franck Ribery. The player impressed enough for Bayern Munich after a trial that they put him into their youth side instead of the Under 19 team very quickly. While the player is also the first Korean to play for the Munich side. He does, however, join a host of Koreans playing in Germany such as Hwang Hee-Chan (Hamburger SV), Park Yi-Young (Saint Pauli) and Lee Jae-Sung (Holstein Kiel). 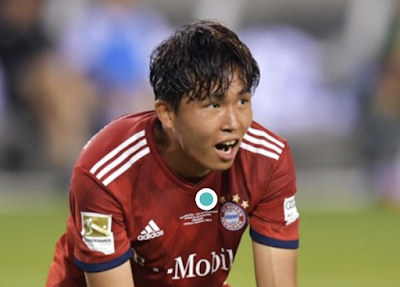 The young Korean played most of 2018 in the Regionalliga in Germany playing for Bayern Münch's second string. The side is made up of under 21 players with the team being used as a way to get players ready for first team football for the players who do not go out on loan. With the young Korean impressing here starting 15 matches and scoring six goals so far this season. Although he played his first game for his club first team this week, he was part of the sides preseason squad. This was seen when the player played 25 minutes against Chicago Fire. This you would imagine is a sign that Niko Kovač the boss at Bayern Munich sees the player as very much part of his future plans. What is sure however is that since signing from Incheon United in January the players already come a long way. As before this week, the player had yet to make a senior appearance for any club as from 2015-2018 the player was part of the youth team at the Incheon club. The fact the player was made the first youth prospect to be given a chance under Kovač would have you believe he's got a chance of getting further chances to impress in Munich. While the player also made Bayern’s first-team squad last month for the club’s German Cup match against SV Rodinghausen. He was also an unused substitute against Bayern Fortuna Dusseldorf last weekend in a Bundesliga. How close is he to the national team? It is always tough to make your debut for your country at a young age but the fact the player is already part of the Bayern first team set up would have you think he is ready. The Korean coach Paulo Bento does not have much time to get his team ready for the Asian Cup but maybe after this, we will see Jeong giving his chance for his country. It is clear right now that the player if he keeps improving has a very bright future ahead of him. As the player is fast and skilful he is everything you could want in an attacking player. He is already showing great confidence in playing at such a high level. South Korea has not yet announced any games post Asian Cup but I could see him getting a chance for his country in 2019. Though with Bento recent squads so far he's thrown some surprises then maybe he will bring the youngster to the Asian Cup in January. What is certain is the future is looking bright for Jeong and South Korea. Meanwhile the player his clearly desperate to fit in at is new club as he is taking five German classes a week.